Journey by 4x4 across the Atlas Mountains to the Sahara desert in eastern Morocco, where the rocks are full of minerals and fossils. Morocco is one of the most geo-diverse nations on earth with enormous areas of exposed rock stretching, full of fossils and minerals, which stretch from the pre-Cambrian to the Recent. The country is dominated by the Atlas Mountains which drop down to a coastal plain on the western side and the Sahara Desert on the eastern side. Due to the arid conditions, much of surface is not vegetated making it very easy to observe the rocks and understand the geology. 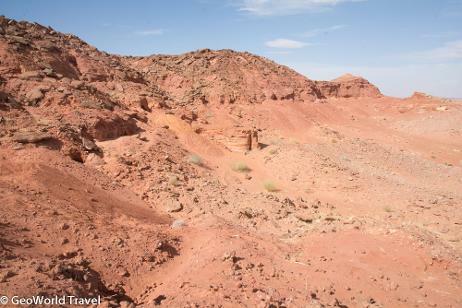 Travel with GeoWorld Travel on desert routes that once hosted the Paris - Dakar Rally, to see incredible wonders: folded rocks, towering sand dunes, metal mines and site upon site where trilobites, ammonites, sharks teeth and even dinosaur remains can be found. On top of this Morocco has amazing cuisine, usually served up in a Tagine! It is a meeting point of cultures where Africa and the Arab World meet Europe. The old city of Marrakech, a World Heritage Site, is the starting and finishing point of many of our tours . Salt mine in Triassic sediments in the Atlas Mountains. Kasbah Ait-Ben-Haddou World Heritage Site. 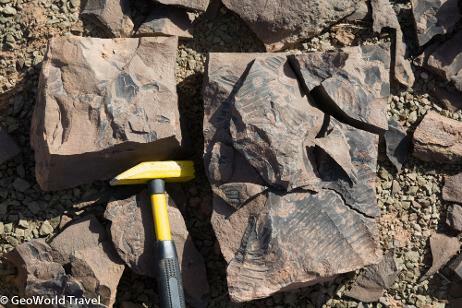 Giant cold water Ordovician (late Tremadocian) trilobites in the Draa Valley. Dou Dib on Jbel Isoumour. Site of many Devonian (late Emsian - early Eifelian) trilobite discoveries. Flexicalymene trilobites in-situ in the Lower Ktaoua Formation of the Ordovician (Katian), on Jbel Tiskaouine mountain. Devonian (Pragian) rocks at Atchana, a site where many trilobites have been discovered. Our accomodation at Mharch oasis with the mud mound of Guelb el Mharch in the background, in the Maider Basin. 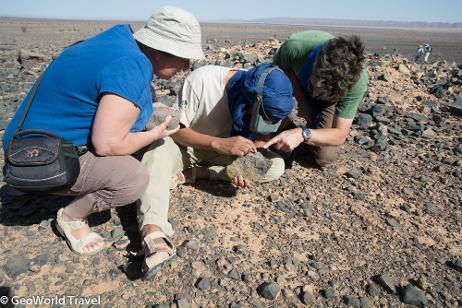 Examining a fossil at Jbel El Mrakib, Maider basin, with a local fossil miner. The famous Cretaceous (Cenomanian) Kem kem fossil beds, deposited by rivers and rich in dinosaur (including Spinosaurus and Carcharodontosaurus), crocodile and fish fossils. Examining mineral specimens at the Filon 12 mine. 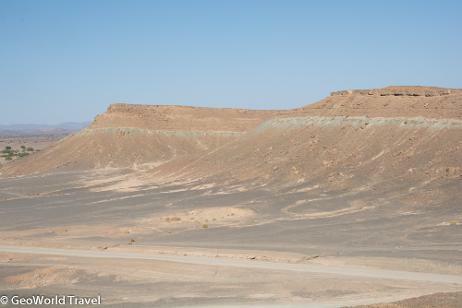 Hamar Laghdad, the Kes Kes, Devonian (middle Emsian) carbonate mounds. Day 1 - Arrival in Marrakech with transfer from the airport to our hotel. This historic city is a World Heritage Site and has excellent low-cost airline links to Europe. 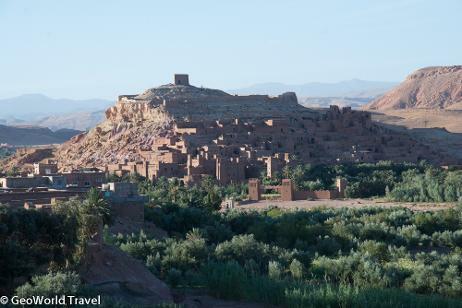 Day 2 - Crossing the Atlas Mountains, and Kasbah Ait-Ben-Haddou World Heritage Site. Today is mostly a travel day. 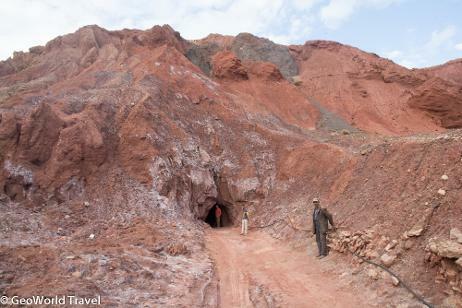 We have to cross the Atlas Mountains to reach the fossil rich areas of the Anti-Atlas. However we have several interesting stops along our way. Our first stop near the village of Sidi Rahal is an agate mine in Triassic lava. Here we can find our own agates with a pink outer layer of opal, as well as having the opportunity of buying prize specimens from the local miners. We then continue on our way up to the Col du Tichka which is 2260m above sea level. Along the way the road passes over rocks of many different ages – Cambrian, Ordovician, Triassic, Jurassic and Cretaceous – which have all been folded as the Atlas thrusted up. After a pause at the summit of the Col, we deviate off the main road following layers of Triassic sediments and lava flows to reach a salt mine. We stop at the salt mine and go inside it for a good look. Our road then swings due south passing through Jurassic, Cretaceous and Eocene layers before reaching the World Heritage Site of Kasbah Ait-Ben-Hoddou. This kasbah (a fortified settlement) was founded in the seventeenth century and lies on the old trading route from Sudan to Marrakesh. The kasbah has been used as a film set for several movies. After our visit we arrive in the city of Ouarzazate where we spend the night. Our accommodation here is a three-star hotel, with en-suite bathrooms. Day 3 - Precambrian Stromatolites, giant Ordovician Trilobites in the Draa Valley and an Orthoceras quarry. This morning we start our day by visiting a site which contains 600 million year old (Edicarian) stromatolites. We then continue to a site in the Draa Valley that is famous for its giant cold water trilobites; these were alive when Morocco was near to the South Pole. These trilobites are Ordovician (Tremadocian) in age and are in the lower part of the famous Fezouta Shale. The trilobites that were mined, and continue to be mined, from this site can be up to 20-30 cm long! Later in the trip we will have the opportunity to see some of them in the Erfoud museum. We then continue our journey to reach the Saredrar Orthoceras quarry which is not far from Tazzarine. Rocks and fossils from this quarry are fashioned into all sorts of beautiful objects such as basins, table tops, bowls and plates and can be found for sale in fossil shops around the world. Orthoceras are cephalopods with straight shells, that are thought to be the ancestors of ammonites, from the Ordovician until the Triassic. The Orthoceras at Saredar are Silurian (Ludlow) in age. The night is spent near the small town of Alnif which prides itself as being the 'Trilobite Capital of the World'. 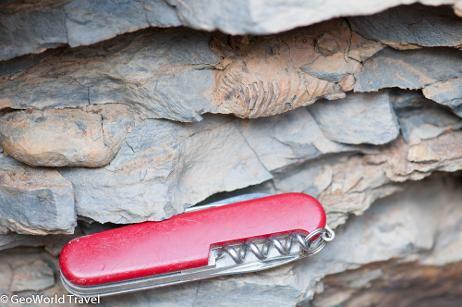 Day 4 – Cambrian and Ordovician trilobites in the Alnif area. Our first stop today is the town of Alnif where we can browse some of the fossil shops. We then head to the north of the town to visit an area where large yellow Cambrian trilobites have been found. These trilobites are Paradoxides and Cambropellas and complete specimens of them can be seen in the Alnif shops. We then visit the well known Jebel Tiskaouine mountain from which huge numbers of ‘calymene’ trilobites have been mined and can be found in fossil shops all over the world. These trilobites are in fact not calymenes but are from generas: Neseuretus, Colpocorypte and Flexicalymens. The trilobites are found in the Ktaoua formation and are of Ordovician (Sandbian/Katian) age. The night is spent in the same hotel in Alnif. Day 5 – The Maider Basin, the ‘Lost World’ of trilobites. Our first stop of the day is known as Bou Dib and is on the north escarpment of the famous trilobite mountain Jbel Isoumour. The rocks here are calcareous marls and limestones and are Devonian (late Emsian – early Eifelian) in age. 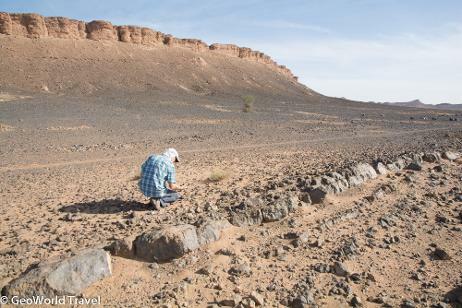 We still spend our time examining the Psychopyge horizon in the Tazoulait Formation that has been quarried for many kilometres, as well as the area below it where loose fossils can be seen lying on the surface. We then continue to the village of Fezzou where we stop for a rest at a café and have an opportunity to meet local people. After Fezzou, we move on to Atchana. Here we can spend time with fossil miners who are working the Ihandar Formation which is also Devonian but slightly younger (Pragian) in age. From this location many wonderful trilobites have been found including Dicranurus monstrosus, and Paralejurus spatuliformis. After this site we journey further south off road all the way to spend the night in a remote desert oasis called Mharch. The accommodation here is the most basic of the trip, in a hotel made of mud, but the rooms are still en-suite. 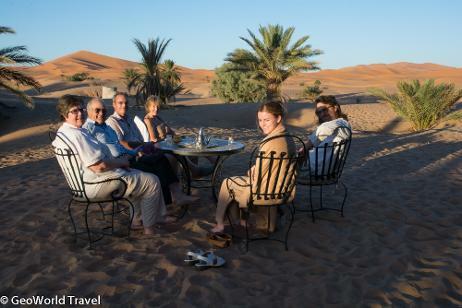 Day 6 – A second day in the Maider Basin, and relocating to the Erg Chebbi Dunes. Our first stop is the mud-mound of Guelb el Mharch. This is a 45m rocky peak that was once a submarine mud volcano formed by hydrothermal vents. Tabulate corals are very abundant as are trilobite and crinoid remains. Additionally, very rare placoderm fish have been found here. 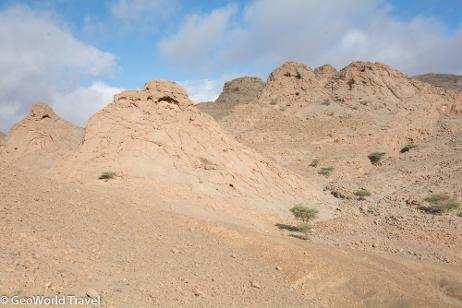 We then journey along the southern rim of the Maider basin visiting two different sites on Jbel El Mrakib were brachiopods, trilobites such as phacops and goniatites can be seen. The rocks are lower- to mid-Devonian in age. We then leave the Maider basin and return to the asphalt/tarmac roads. Near the city of Rissani we stop at a site of upper Devonian (Framennian) age where orthoceras and ammonoids can be seen in huge slabs of red limestone. We then head to Merzouga and the famous sand dunes of Erg Chebbi. Here we really feel that we are in the Sahara Desert - because we are! If you wish, you can even ride a camel here. The next three nights are spent in a 4-Star hotel in Merzouga. Day 7 - Kem Kem Dinosaur site and Filon Mineral mine. Today we drive south through the sand dunes to the frontier town of Taouz. We then head to the famous Kem Kem site which is rich in fish, crocodiles and dinosaurs. The rocks are Cretaceous (Cenomanian) in age and were formed by rivers flowing into lakes. This site has also yielded many teeth and bones of the dinosaurs Spinosaurus and Carcharodonosaurus. We spend the whole morning at this site before moving on to a site on the other side of Taouz were Ordovician, Silurian and Devonian layers can all be seen very close to each other because they are folded. In rocks that lie on the Silurian and Devonian boundary, we can see the remains of pelagic crinoids and their floats called labolith. In this area local miners have dug several pits to collect the fossils, and we can observe wonderful specimens in the museum in Erfoud. Our next stop is the nearby by Filon 12 mine. This mine used to be a lead mine, but is now exclusively mined to collect beautiful mineral specimens which are sold to museums and mineral collectors. One of the most beautiful minerals to be mined here is vanadinite. At the mine we can take an underground tour and examine the specimens for sale which include haematite, goethite and quartz. The night is spent at the same hotel in Merzouga - an excellent place to observe the stars. Day 8 - Kess Kess and Erfoud. Today we visit Hamar Laghdad also know as the Kes Kes which are Devonian cold seep mud volcano mounds on which rich coral reefs grew. We then visit a site where crinoids are mined in bell pits before reaching Erfoud quarry where orthoceras slabs with goniatites are quarried. The rocks here are mid-Devonian in age. After a picnic we head to the town of Erfoud where we visit the museum, getting to see specimens collecting in many of the sites we visited, and the Orthoceras factory. The Orthoceras factory is a marvel and we can see how the quarried Orthoceras slabs are made into many beautiful objects. The night is spent back in the hotel in Merzouga. 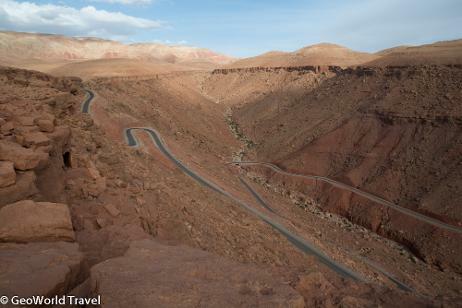 Day 9 - Tohdra Gorge and the drive back to Ouarzazate. Today is spent driving from Merzouga back to Ouarzazate. Halfway along our route we stop at the stunning Tohdra Gorge. We spend about an hour walking around the gorge which cuts through Jurassic layers at the edge of the High Atlas. After lunch we resume our journey arriving in Ouarzazate at the end of the afternoon. Day 10 – Drive back to Marrakech and optional visit to the World Heritage medina and souk of Marrakesh. Today we drive back to Marrakech, arriving mid-afternoon leaving free time for shopping in the World Heritage Site souk. The night is spent at the same hotel near the airport as on day 1. Day 11 - Departure from our hotel to the airport by taxi. "This was an outstanding tour. 2 months later I still keep thinking of the trip into the Sahara with fossils at every stop. The value for money, accommodation and food were all excellent. The other guests ranging from top academics to the village idiot (me) were all most sympathetic and supportive.Everything was explained to me in the simplest terms. Now I just love Stromatolites, Trilobites and Ammonites. Little touches like the drivers choice of wonderful West African music and the comfort of the 2 Land Cruisers really helped make the trip memorable. The Moroccan landscape is superb and the Berber people most welcoming. If you see the latest Mission impossible and/or James Bond movies you will get a taste of the brilliant Moroccan Sahara. 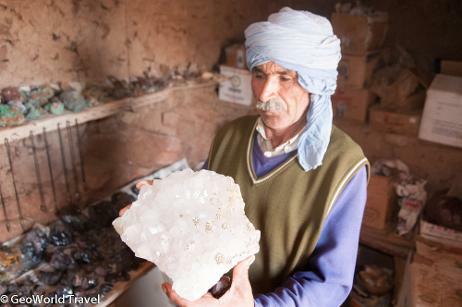 "A brilliant trip with fascinating fossil sites amid stunning Moroccan scenery. Transport organised with two impressive local drivers who also loved the off-road aspects; comfortable hotels at each stop with real treats at the furthest flung; meals all included from hotel breakfasts and dinners to tree-shaded picnics in the fantastic middle of nowhere; geological knowledge and guidance from our tour leader, and most other group members too; and a lovely group of fellow enthusiasts, all finding fossils galore. An excellent trip James! " "A superb trip - the sort I would have designed for myself except I'd not have had the local knowledge or contacts to make it a reality. Comfortable accommodation, a great guide (James) and a friendly and expert driver (Yusef) who both put themselves out for us. We visited some wonderful locations, from an Atlas salt mine to pre-cambrian stromatolites, trilobite beds and desert dune fields. The only let down, and the only thing I wouldn't want to do again was eat the chicken in our last hotel in Marrakech, which made me very ill for 2 days after getting home. Not GeoWorld's fault at all, but the lesson is, stick to the local food, which they know how to cook!" 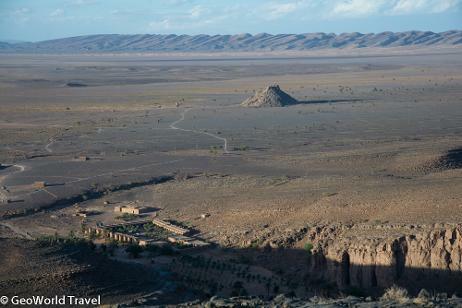 "Having an 8-day trip through Morocco is basically impossible. However, GeoWorld managed it anyway! In a fast run we've seen 14 fossil rich sites, with a knowledgeable guide and a perfect driver. Enough room for sightseeing, especially the very impressive landscapes. If you have the opportunity, take the 10-day tour. It will make your trip a bit more relaxing. I would. The four of us have enjoyed this trip a lot. Absolutely worth every penny!!"